If you have ever eaten homemade chocolates which are glossy, and the chocolate snaps easily and doesn’t melt at room temperature, that chocolate has been tempered. To obtain this glorious substance, it requires that you heat the chocolate, cool it, and heat it again; the catch is that each step requires a different temperature, and that temperature depends on what brand and flavour of chocolate you are using. Chocolate contains cocoa butter, which contains fat. As it heats, the cocoa butter will crystalize, and it can go through 6 different forms. The fat crystals in tempered chocolate are Stage V, and that’s what you need to learn how to do. This can be done on the stove via a double-boiler, or in the microwave which is a lot easier. I’ve read a few different books and websites on this issue, and none of them use the exact same temperatures, so I’m going to tell you what works for me, and I’ve tested it out on Callebaut chocolate, Baker’s brand, and No Name brand. 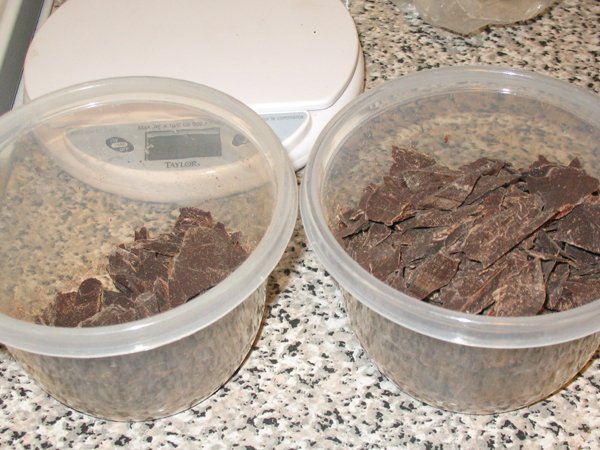 I use a kitchen scale to weigh my chocolate after it’s been chopped, and divide into two bowls; Bowl A contains two-thirds of the chocolate, and Bowl B holds the last third. Microwave on High, stirring every 30 seconds, until nearly all of the chocolate has melted. Do not keep heating it until the entire amount is melted, that is too much. 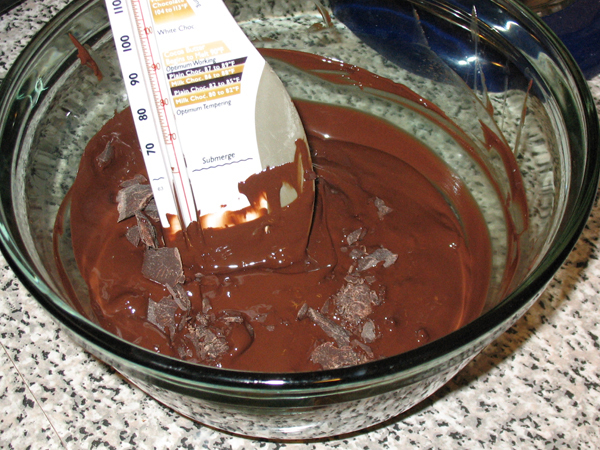 When most of it is melted but a few pieces remain, set it on the counter, keep stirring and watch the thermometer climb, as soon as it hits the right temperature, immediately add all of the chocolate from Bowl B and stir like mad. Keep stirring until all of the chocolate is completely melted, and then set it on the window sill and open the window, or just leave it on the counter. Either way, stir frequently because stirring agitates the fat crystals and encourages more Form V crystals to grow. On a cold winter day, the bowl will cool in about 5-7 minutes. It’ll take around an hour if you just leave it on the counter. Reheat the bowl carefully. I do 10 second bursts. You are only increasing the temperature by 8 degrees for dark and semi-sweet, 6 degrees for milk, and 4 degrees for white, that is a small margin and will not take long. I heat it for 10 seconds, and then let it sit and watch the thermometer, if 30 seconds go by and it hasn’t hit the right temperature, I do another 10 seconds, and then let it sit again. If you heat it too much it goes out of temper and you need to do steps 2 and 3 all over again. Now the chocolate is ready to be poured into moulds or whatever you have planned to do. It will continue to cool, if you find it is becoming too hard to work with, repeat step 3.